The End of the Affair is the startlingly honest account of the aftermath of an affair. Told from the perspective of Bendrix, the novel is his attempt to discover why his affair with Sarah ended and his attempt to reclaim her as his own. Compact yet complex, Greene manages to fit plenty into The End of the Affair. The novel is a multi-layered tale that isn’t simply about the romantic love between Bendrix and Sarah but is also about all kinds of relationships: marriage, friendship and faith. It is also a fascinating exploration of jealousy, obsession, morality, and the fine line between love and hate. Greene writes of the nuances of love in a compelling and insightful novel that keeps readers’ gripped in its embrace. The novel also moves into more philosophical territory, adding yet another complex element. A jealous lover with a need for control, Bendrix is desperate to find out why Sarah ended their affair. Along with Bendrix we explore their affair, seeing his despair at the knowledge that it will inevitably end, giving a sense of impending doom to the novel. When Sarah ends the affair, she keeps her reasons to herself but Bendrix finds out, along with us, through her diaries, building tension and atmosphere. I found the fact that he is an author really interesting, particularly as he uses the form to decipher and comprehend their relationship. I loved Greene’s writing style in The End of the Affair. His precise observations, startlingly honest insights, and fluid prose make the novel a joy to read and I couldn’t help be carried through the story. Written in the first person, we are given an intimate position in Bendrix and Sarah’s affair. Even when we move away from Bendrix’s perspective and read Sarah’s diaries along with him, we are also granted private insights. Yet what is also cleverly done is we’re not always told everything – although we are in a privileged position, the characters can still choose what to reveal. Many contemporary novels are written in the first person and as a reader we are used to the intimacy this grants us. Yet according to this article in the Independent, The End of the Affair was the first novel where Greene used the first person narrative. Taking this into account, it makes the novel seem even more intimate. The fact that this novel is also said to be about Greene’s own affair with Lady Catherine Walston (my copy of the novel is dedicated to ‘C’) emphasises how frank this novel is. Taut, precise, pared down, moving, and insightful, The End of the Affair is a real gem that I can’t recommend enough. If this novel is anything to go by, I’m eager to explore more of Graham Greene’s work. 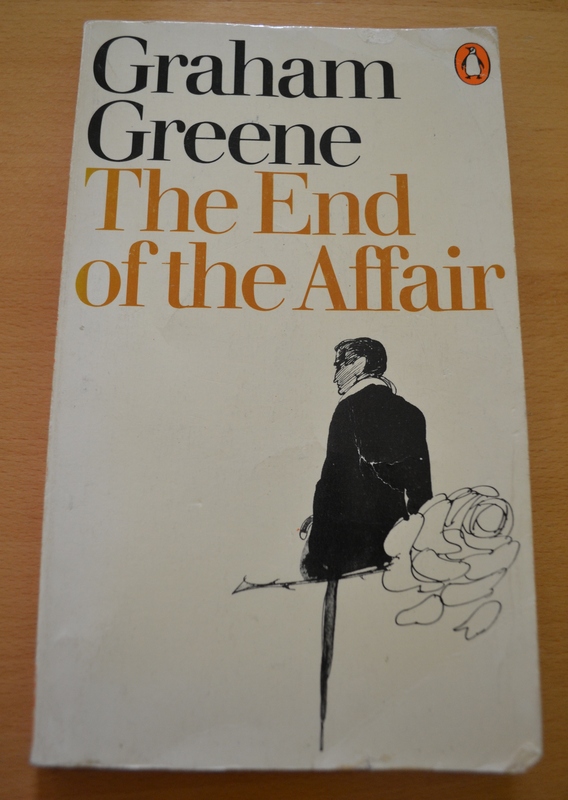 Have you read The End of the Affair or any other of Greene’s novels? Are there any you could recommend? This sounds like a really interesting book – I’ll have to add it to my reading list. It sounds a little bit like The Kreutzer Sonata by Tolstoy, which I really enjoyed, and also deals with feelings of extreme jealousy. I didn’t love this (my review here: http://bookaweekblog.wordpress.com/2013/11/03/2-the-end-of-the-affair-graham-greene/) but I thought/ think Brighton Rock is excellent. I’ll have to check that one out, thanks for the recommendation! Amazing review! This is such a great book, I love Greene and something about how frank he is in this novel meant that I found reading it a very raw experience. And I think the last few sentences are some of the best in English Literature, they break my heart every time I read them. Thank you 🙂 I agree, the last lines are just so sad and memorable.